Simply elegant in blue on pale blue stripes, this pyramid favor box keeps sweet treats for your wedding, bridal or baby shower party! Your guests will be tempted to tug on the satin white ribbon to see what sweet treat you have in store for them - fill them with confetti candy, jelly beans, something chocolaty or anything creative! 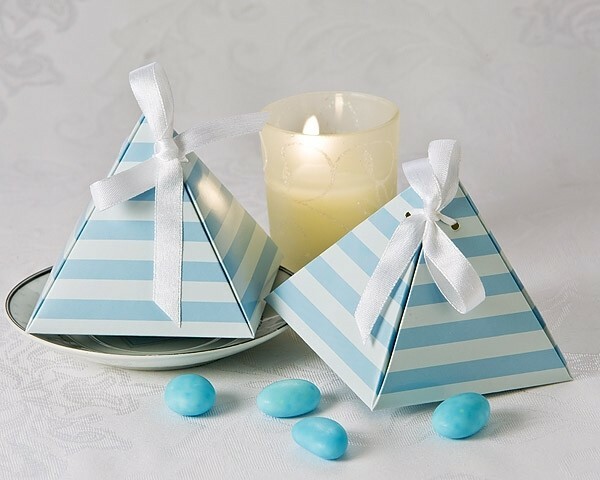 When the little details count, these budget friendly favor boxes let you add the splash of "Something Blue" you've been looking for. Quality glossy finish and white satin ribbon round out this generously sized pyramid shaped favor box. Created by Artisano Designs.